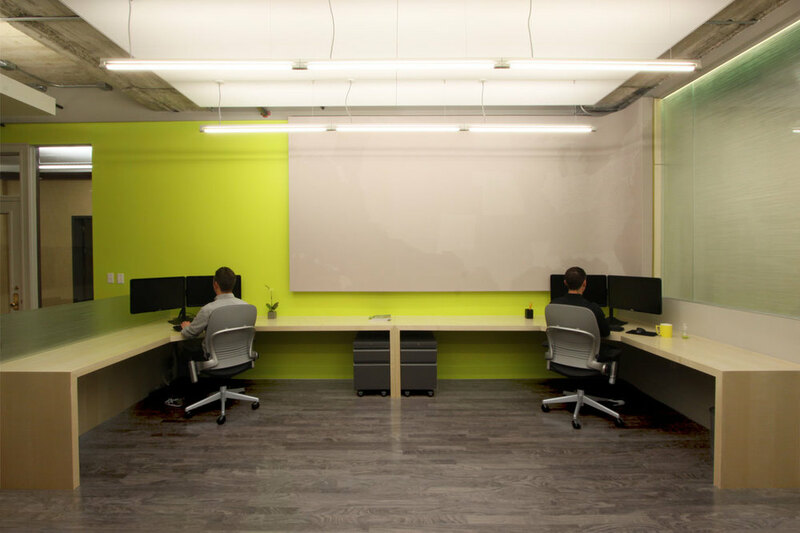 10 Exchange is a collaborative work environment for two very different investment companies, located in a historic 1905 building in downtown Salt Lake City. The fund managers/owners of the two firms are constantly on the move; their odd courtship is based on perceived synergies in pooling resources (certain administrative functions, collective spaces such as conference and kitchen functions, etc). While both groups have found success due to their acutely focused fields of research, they recognize the potential biases and prejudices that such specialization can be at risk of producing. Accordingly, they sought to produce a work space that allowed for a great deal of intellectual exchange. 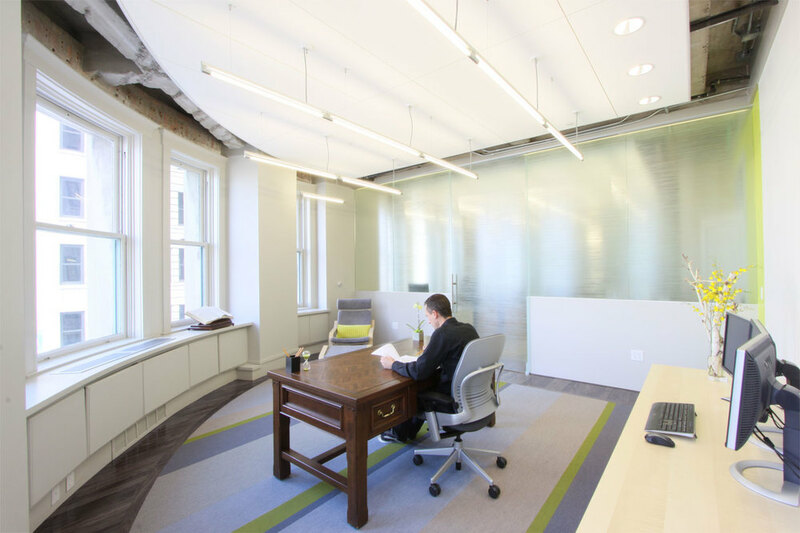 Unfortunately, SEC regulations require that each company has a clearly defined space. Acoustical concerns further complicate the desire for cross-pollenization. The project thus seeks to produce a tone of openness through its lighting and materiality. In consideration of the fact both clients deal with data as the exclusive modes of input and output of their work, the project employs data as décor. 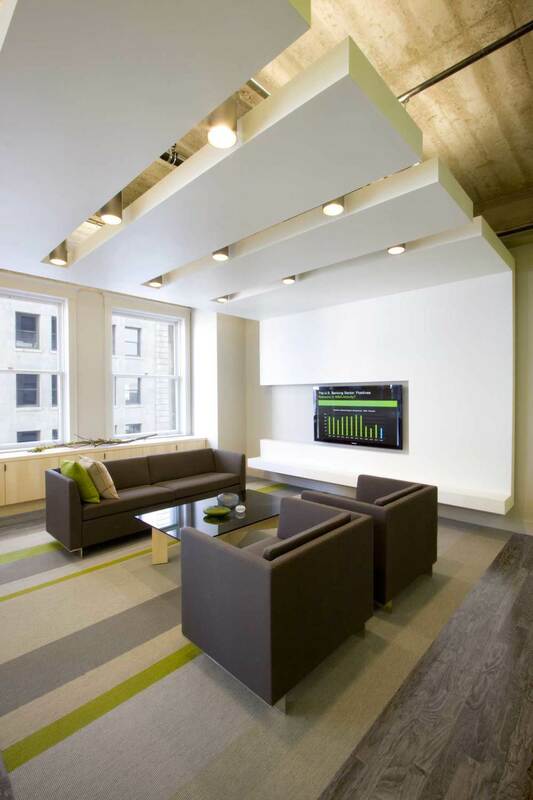 A curved wall becomes a supergraphic canvas, subtly indexing investments and state regulatory differences. 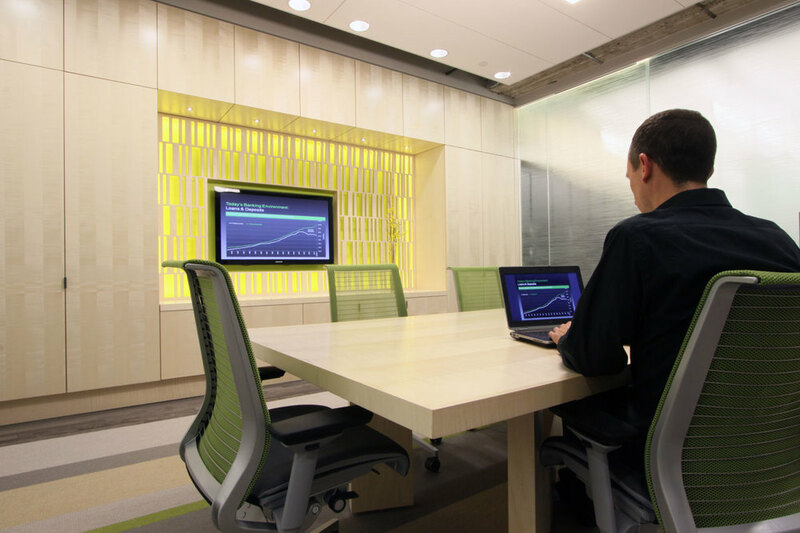 Binary data is CNC routed into millwork, and market performance is graphed three dimensionally to produce a lighting topography. Snuck into an office that otherwise requires a highly buttoned-down appearance for visits from conservative investors, these items act as an abstract time capsule, a reference point for two businesses in continuous and exaggerated flux. Flames are replaced by CNBC in the hearth, the focal point of the informal Living Room collaboration space. The historic building had been the victim of several insensitive office interventions aimed at producing themed historicism. The new design exposes the skin and bones of the original building, making a deliberate attempt to emphasize the distinction between historic and contemporary, with occasional cheeky flourish.